Skin cancer is highly curable when caught early. Do you know how to SPOT skin cancer? Home » News » News » Skin cancer is highly curable when caught early. Do you know how to SPOT skin cancer? The American Academy of Dermatology is coordinating this national effort to raise awareness of skin cancer. 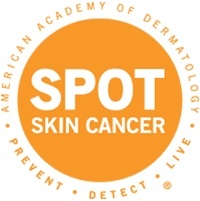 Join Solano Dermatology Associates in the American Academy of Dermatology’s fight against skin cancer by participating in SPOT Orange on Melanoma Monday. Wear orange Monday, May 6, 2013 to show your support!